A 12-week hassle-free guarantee of vibrant greens. The Grove’s Microgreens CSA Membership is simple. You commit to 12 weekly shares and we guarantee you 12 weeks of greens of unparalleled quality and shelf-life, delivered to or near you, or available for pick-up at The Grove at your convenience. As an athlete, health professional, and lover of healthy food, I am thrilled to have access to fresh, nutrient-dense, locally grown micro greens year-round. The Grove offers a wonderful variety of micro greens that can be incorporated into any (and every) meal. I particularly love toast topped with smashed avocado and sunflower micro greens for breakfast! I feel so lucky that The Grove’s micro greens CSA is now available to Anchorage residents. Microgreens from the Grove have changed my life! They are so good and delicious. I look forward to my delivery day each week. Not only are they healthy and nutritious, but they are beautiful and grown with love. I wish everyone could experience the great colors, textures, and flavors of these greens. They are amazing! I use them in salads, smoothies, stir fry dinners, or just plain, right out of the bag. My whole family loves them. We are so lucky! Below is the pricing list of our varieties of microgreens. Remember, with respect to our CSA program, these are per week rates and your weekly total will be multiplied by 12 to determine your total 12-week membership fee. If you’d like a variety and aren’t sure or particular about which kinds, one of the Aurora Mixes are for you! The Aurora Mixes are a revolving combination of colorful greens with regards to what is available and what is looking good that particular harvest. The Mild Mix will not have radish included and the Spicy Aurora Mix will, for those who appreciate an extra zing! Our most popular single variety, sunflower is nutty (like sunflower seeds), sweet, has a great crunch, and an incredible shelf-life. We’ve lost sunflower in the back of the fridge for over a month and they’ve still been edible! Incredibly light and fluffy, pea shoots have a delicate pea flavor and provide lots of volume to any salad, sandwich, or dish. We’ve discovered that pea shoots are also great for sauteing. Green radish adds a deliciously spicy kick to any salad or dish. Unsurprisingly, it tastes like radish, and is also loaded with vitamins and anti-cancer nutrients such as glucosionates. If you like spicy, the taste of radish, and still want one of the most nutrient-dense microgreens, radish is the choice for you. Slightly bitter and mildly tasting, broccoli tastes like many in the brassica family. The reason we include broccoli in our line-up is its incredibly high levels of the precursors to sulfurophane, a nutrient thats aid in cancer prevention, improves gut bacterial flora, and helps ameliorate obesity. Red cabbage microgreens have beautiful, dark red tones that give stunning color to any dish. In addition to being very visually appealing, red cabbage contains many health enhancing phytochemicals and also contains sulfurophane. It has a mild cabbage flavor. Everything that applies to green radish also applies to red radish, except that the red has even higher levels of phytochemicals and is even more beautiful! Amaranth is probably the most strikingly beautiful microgreen out there. It’s color ranges from purple to pink to magenta and is incredibly vivid. It has an earthy flavor, reminiscent of beet or chard, but not as strong. It is incredibly delicate and fluffy, so a little bit truly goes a long way. If you want to add intense color to your dinner plates and impress your friends, this microgreen is for you! 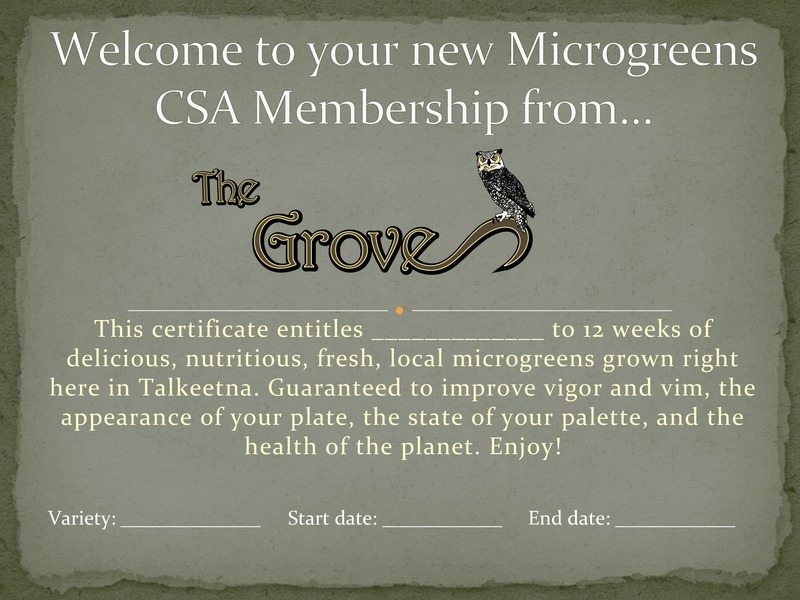 Do you have a friend or loved one who would appreciate a Microgreens CSA Gift Certificate from The Grove? Fill out the Sign-Up Form to the right and indicate as much in the “Anything Else?” message at the bottom of the form. We’ll happily edit the image below and send you or the giftee this certificate on high quality cardstock for a unique gift, thank you, or whatever the occassion. Choose your varieties (descriptions to the left) and fill out the sign-up form below. There is a $5 weekly minimum for each membership. There must be at least 2 ozs. of greens in each to bag. Your membership fee will be your weekly fee multiplied by 12 (weeks). Once we receive your form, we will review it and contact you with with any additional info or clarification needed. If everything looks good, we'll send you an e-bill and agreement form for your records with all the pertinent information (e.g. start date, end date, delivery location, etc., and your total balance). Once your balance is paid we'll start your weekly shares of delicious superfood for you to enjoy! How many ounces of Sunflower Shoots would you like? How many ounces of Pea Shoots would you like? How many ounces of Green Radish Microgreens would you like? How many ounces of Broccoli Microgreens would you like? How many ounces of Red Cabbage Microgreens would you like? How many ounces of Red Radish Microgreens would you like? How many ounces of Amaranth microgreens would you like? Please describe how you would like your greens mixed. Please request another location. If you'd like home delivery, please provide address and/or directions to your home. We will confirm with you whether or not we will be able to accommodate you. If, for any harvest, we're unable to completely or accurately fill your order, what would you like us to do? If, for any harvest, we're unable to completely or accurately fill your order, what would you like us to do? Substitute with ANY variety of microgreens available. Substitute with more of my CHOSEN varieties that you DO have. Cancel my order and add a week on to the end of my membership period.